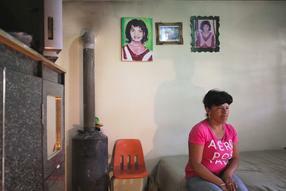 Juárez is nicknamed ‘the capital of murdered women.’ The Mexican border city of 1.5 million inhabitants draws tens of thousands of young women from small, poor towns with $55-a-week jobs in the factories owned by corporations as General Electric and DuPont. The murder rates are truly shocking: 3,075 in 2010 alone (474 of them were women), blamed on drug cartels and serial killers. Only 2% of these murder cases have been investigated and many of the mothers have themselves received death threats simply for demanding justice. Since 1993 1,400 women have been murdered or are unaccounted for. Irish artist Brian Maguire has spent three years working with these women to bring their stories to the international community. Well known for his social and political commitment, Maguire creates portraits of the missing women which he then shares with their families; he also produces a larger work to be included in an international touring exhibition. Director McLoughlin and his team have made an incredibly powerful film, brutal and unflinching in its depiction of this lawless society, yet emotional in the silent moments between the mothers and the wonderfully empathetic Maguire.